Excitebike 64 is a motocross racer and the sequel to the NES classic Excitebike (1984). It consists of Season (five rounds with five races in each), Exhibition (single race), Time Trials (beat your best time), Special Tracks (bonus courses) and Custom Tracks (make your own courses). The racing adopts more of a simulation approach and in that sense it doesn't really feel anything like the NES original. The controls are very sensitive and complex, and it takes a while to become comfortable with the amount of cornering, stunts and boosts you can do, all while remembering to attack your opponents and stay on the track. In that sense it's similar to 1080° Snowboarding (1998, N64) in that there's a steep learning curve but tons of depth that rewards patient players. Once you get into a rhythm the racing is exhilarating and there's nothing quite like boosting off a ramp, catching big air and then angling your bike diagonally to land on the perfect racing line! The tracks don't have a lot of personality, but there is a nice mixture of wide-open outdoor environments (where you can focus more on the racing) and indoor circuits (where the narrow lanes force you to learn the wheel clip technique to knock down fellow riders). What I really don't like though is the hit-and-miss collision detection mixed with the irritating amount of objects that litter the edges of the tracks, as you'll often bail when your bike lightly scrapes an inconspicuous part of the scenery. The unlockable Special Tracks are a great incentive to keep playing (especially the cool Desert variation where your objective is to touch ten campfires before your opponents), and the Custom Tracks option is intuitive with a wide range of available pieces. 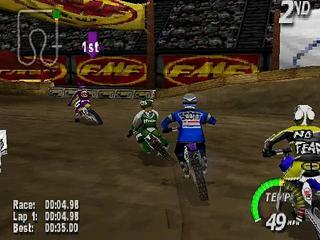 Excitebike 64 is a decent racer and once you get used to its elaborate control scheme there's plenty of high-speed thrills to be had. However, if you're hoping for the same kind of Arcade action from the NES title you'll likely be disappointed, as the simulation approach takes away much of the original's personality and accessibility. Random trivia: A pre-release version of the game with a few minor differences is available online.